The Missouri offense is just terrible and it took everything the Tigers had to knockoff UConn. The Huskies had an opportunity to tie up the game with less than a minute left by attempting a 42-yard field goal, but the Huskies decided to try a fake field goal and well it didn’t go according to plan. Missouri safety Anthony Sherrils picked the pass off and all the Tigers had to do was take a knee. 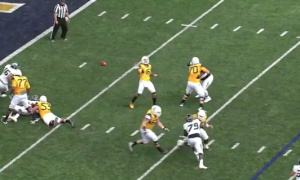 The Missouri special teams played a major role in the game with a blocked punt for a safety earlier in the game. It was an ugly game for Missouri, but they still pulled out the victory, 9-6. It seems like every season the Tigers have a game like this one.